Now that's what I consider thought-provoking media. I'm not sure if planning communities around people is all that it takes to "get more people;" however, I do believe that the majority of urban planners are brainwashed into planning communities for the heartless, soulless masses of metal that race through widened streets. Fun. If you're interested in learning what really works, then I highly recommend that you read City Comforts: How to Build and Urban Village. If you have even a slightest concern for the proper planning of communities, then READ THIS BOOK! 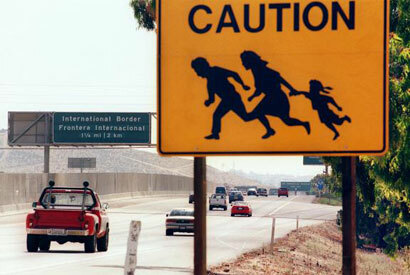 Our representatives in the Senate were recently debating an immigration bill that ultimately (and thankfully) failed. This lame bill did all the right things that most bills in the Congress do: (1) place band-aids on festering wounds, (2) spend lots of money, and (3) avoid the real root of the problem. Politicians ... why, why, why are you so silly? You see, illegal aliens aren't here in America (illegally) to loiter and relax; they'd starve to death if that's all they did. To the contrary, they're here to work and send a sizable portion of their earning back to their families in Mexico, Honduras, etc. via Western Union. Here's the deal though ... illegal aliens would not come to America if employers were required to unequivocally verify the legal working status of each prospective employee. The demand for illegal alien labor is obviously large, so it seems obvious that the supply of illegal alien labor will follow. With that in mind, perhaps we shouldn't be worrying about all of these ill-placed band-aids. Instead, to counter the effects of this economic principle, we should focus on eliminating the demand for illegal labor. If the demand is effectively eliminated, the supply will dry up -- guaranteed. It's elementary my dear American. I really shouldn't complain. My family lives in a comfortable home in a really nice neighborhood that's close to a city park (with pool) and a top-rated elementary school. I work about three miles from my home, and on nice days, I can ride my 110 (plus) mile-per-gallon Honda Metropolitan to and from work. All in all, I really shouldn't complain. But alas ... I do. I wish I didn't have to ride anything to work. To be perfectly honest, I'd rather walk. Call me crazy, but I'd rather walk to work, walk to lunch, and I'd prefer to walk to the store on my walk home to pick up those "Honey, could you pick up ..." items. In my tiny suburb of Heidelberg, Germany, I remember being able to walk to various places like the ice skating rink (Eishalle), the local Italian ice cafe (Eiscafe), stores like Woolworth, the bread store (Bäckerei), the local meat market (Metzgerei), and so on, all without breaking a sweat or worrying about losing "time." Now I spend countless minutes per week on streets built for cars (not humans) scurrying about town as I try to complete the chores of the day. (sigh) What happened to human-scale communities? Well ... I have a few ideas, but I'll save those for another post. I agree, it would be nice to be able to walk everywhere. The thing is, even if you could walk, you would break a sweat in the Texas summer heat and you'd come to work a'reekin'. Heck, I break a sweat walking from my car to the grocery store. Okay ... so I'm behind the "power curve" when it comes to blogging. Who cares? This isn't being created for fame or fortune; nor does its birth stem from dreams of power or control. Instead, I've created this personal forum to serve as a canvas for my thoughts alone. 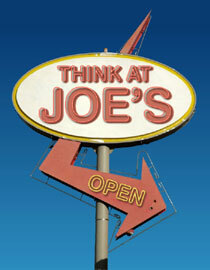 Hence the name, "Think at Joe's." This is my place, not yours, and even though you don't own it, I welcome you to stay here as long as you like. I won't guarantee regular postings, but I will promise original content that means something to me, and hopefully it will become meaningful to you, too. Further, don't expect to see links to other blogs or endorsements for other writers, and don't look for advertising, either, because I liken ads in blogs to litter on streets. I might, however, link into Amazon.com to highlight books that I've read that I believe should be a part of your library, too. Short of being a manifesto, I just want to welcome you and invite you to read with an open mind as I present personal thoughts and observations about the world around me. Don't be scared ... just enjoy.